Gaining a new customer for your business takes great efforts, and it’s always a painful moment when an entrepreneur loses a client. It is a bad experience usually referred to as customer churn and every business whether new, small, large or successful can suffer from it. 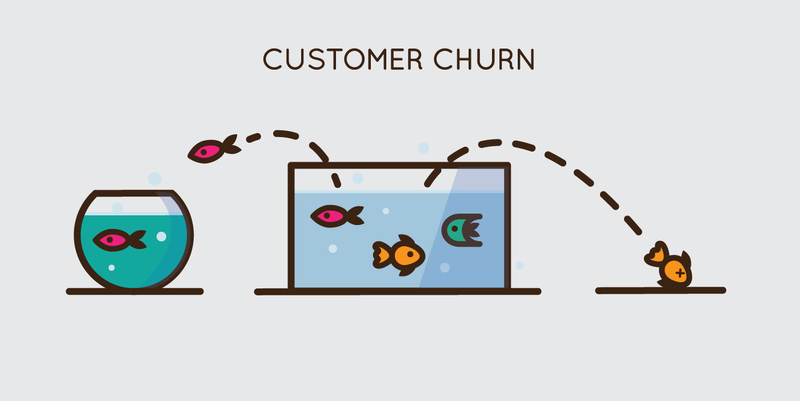 The best way to start fighting customer churn is by understanding why customers are abandoning your business and if possible get to know the rate at which they are leaving. Are your prices unfairly high? Is your customer service wanting? How about your quality; are you consistent or have you compromised it? Are your products or services becoming obsolete because of something new trending? Evaluate your business, and once you understand where your problem is coming from, you will take the necessary course of action. • Divide the total number of customers lost with the number of customers you had at the beginning of a specific period and then multiply by 100 to get the rate in percentage. For instance, if you had 200 clients at the beginning of the month, but in the end, you realize you lost 5 of the clients, this is how you calculate the churn rate. • You can also use your revenues to calculate your client churn rate whereby you calculate the total amount lost during a certain period and monthly re-occurring revenue (MRR). However, when using MRR, you will have to consider the increase in revenue due to new clients acquired or upgrades realized in that same month. For example, if your company MRR is $1 million and at the end of the month the amount falls to $900,000, and new upgrades and clients brought in $120,000, this is how you calculate the churn rate. In such a case, the company has a negative churn rate which means that despite that some clients abandoned it in that month, they still ended up making more money. No one loves clients churn, but if you are experiencing it already, you can follow the tips below to lower your customer churn rate. When a customer visits for the first time, you always have a golden chance to either attain customer success or fail. Make sure you blow them away with a good first impression, and they will not have a reason to go shopping from someone else’s business. Every time a customer visits your shop, they have expectations, and if you want to retain such customers, you must be prepared to either meet their expectation or if possible exceed their expectations by far. Failing to deliver anything you promised to your client is one of the top reason for customer churn. Capitalize on providing the best customer service to your client. This point sounds so obvious, but numerous companies have a problem in this area. The customer is always right as they say and instead of frustrating them, consider explaining everything whether it’s an online inquiry or a face to face inquiry. Gaining a new customer is harder than retaining an existing client. Also, it is much cheaper to retain an existing client that it is to gain a new one. These two facts are enough reasons why you need to focus more on retaining customers and customer success tactics for your business growth. Author Bio: Douglas Pitassi is a freelance writer and small business blogger.